5:40am check-in at San Antonio airport for your trans- Atlantic American Airlines flight to Shannon, departing at 7:40am, via Philadelphia. Early morning arrival in Shannon meet the group and guide. Drive to Limerick city where we see King Johns Castle and the Treaty Stone. Continue to Adare and admire the picturesque thatched cottages that line the Main street. Stop at the Parish Church in Newcastle West for our first pilgrimage Mass. Drive to Tralee capital of The Kingdom where we remember Mary OConnor, the original Rose of Tralee, hear the story, and visit her grave. Lunchtime arrival in Killarney, check into Scotts Hotel, and partake of a light lunch. Afternoon Jaunting Cart trip to Ross Castle followed by a boat trip on the Lakes of Killarney. Return to hotel for dinner & breakfast. Morning Mass in Killarney Cathedral. Day tour of the renowned Ring of Kerry, visiting the Gap of Dunloe, Killorglin famous for its annual Puck Fair, Glenbeigh, Caherciveen, Waterville, Caherdaniel, Sneem, Kenmare and Molls Gap (Ladies View). Return to hotel for dinner. Evening local entertainment. After breakfast drive to Ballyvourney and visit the Holy Well of St. Gobnait (6th cent). Continue to the village of Blarney. 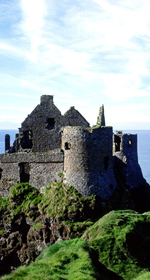 Ascend the Castle to kiss the famous Blarney Stone and receive the gift of elequence. Visit the Blarney Woollen Mills. Afternoon drive to Cashel and see the impressive Rock of Cashel seat of the Kings of Munster. 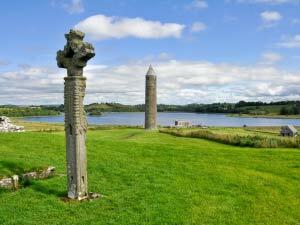 St Patrick visited here in A.D.450. Hear the story of the Devils Bit and see the wall tomb of Archbishop Myler McGrath. Celebrate Mass at nearby Holycross Abbey, so called because it holds a Relic of the True Cross. Arrive in Dublin and check into the Holiday Inn Hotel for 2 nights with breakfast. Dinner this evening in local restaurant. Morning panoramic tour includes: OConnell Street with the Millennium Spire and the historic GPO, Abbey Theatre, Customs House, Trinity College, Leinster House seat of the Irish Government, Georgian Squares, Ballsbridge Showgrounds, City Hall, Dublin Castle, Christchurch & St Patricks Cathedrals, Guinness Brewery, Kilmainham Jail, and the Phoenix Park. Mass at the Oblate Grotto a replica of the Grotto at Lourdes. Afternoon trip to Glendalough the Glen of the Two Lakes see the remains of the 6th century monastic settlement of St Kevin. Return to Dublin via the scenic Wicklow Gap. Evening dinner/cabaret in The Merry Ploughboy. After breakfast, depart for the Hill of Slane where St Patrick lit the Pascal Fire. In Drogheda, we visit the Shrine of St Oliver Plunkett, martyred in 1681. Continuing to Faughert, where St Brigid was born in 454 AD, we visit the Holy Well of St Brigid, and celebrate Mass. Remarkable cures have been experienced here at the Well, the Head Stone, the Knee Stone and the Back Stone. This afternoon we travel to Downpatrick: In Down, one Grave three Saints do fill, Patrick, Brigid and Colmcille. Here we see the grave of St Patrick. At nearby Saul we remember St Patricks landing, to begin his mission in Ireland. Continue to Belfast and check into Crowne Plaza Hotel for 2 nights, dinner and breakfast. 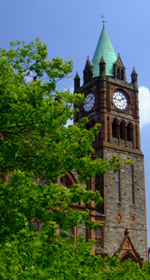 Morning panoramic tour includes: City Hall, Donegal Square, Linenhall Library, Queens University, Stormont Parliament Building, and St Peters Pro-Cathedral, where we celebrate Mass. Visit to the popular attraction The Titanic Centre. The Titanic Experience extends over 9 interactive galleries, with multiple dimensions to the exhibition, drawing together special effects, dark rides, full-scale reconstructions and innovative interactive features. Explore the shipyard, travel to the depths of the ocean, and uncover the true legend of the Titanic in the city where it all began. This afternoon we visit the Giants Causeway on the Antrim coast. This amazing rock formation is due to the cooling of the lava, resulting in the splitting of the basaltic rock into mostly hexagonal columns. Time permitting, we may visit Slemish Mountain, where St Patrick, as a slave, tended the flocks of his master for 6 years. Return to hotel for dinner. Morning drive to Armagh the Ecclesiastical Capital of Ireland, where we visit the Cathedral of St Patrick and celebrate Mass. Continue to Enniskillen for lunch break. Here we see the 16th century Castle, now a military museum, and the Bill Clinton Centre, on the site of the Remembrance Day Bombing of 1987. Afternoon depart for Attymass, where we visit the home Fr Patrick Peyton, the Rosary Priest. Continue to Knock, and check into Knock House Hotel for 2 nights, dinner & breakfast. This morning we spend in Knock, where, on 21st August 1879, Our Blessed Lady appeared along with St Joseph, St John, and Jesus in the form of the Lamb of God, at the gable end of the small parish church. Celebrate Mass in the Apparition Chapel, followed by a tour of the shrine. This afternoon we visit the 13th century Cistercian Abbey at Ballintubber, then continue to Croagh Patrick, where St Patrick fasted for 40 days. Drive via Louisburgh (Gods Pocket) and across Connemara to visit John Waynes Quiet Man cottage in Cong. Return to hotel for dinner & overnight. After breakfast depart for Galway. Visit the Cathedral and celebrate Mass. See the Salmon Weir, Spanish Arch and Eyre Square. Continue to The Burren an area of 50 square miles of bare limestone rock with very little soil, but remarkable amounts of various flora. We next arrive at one of Irelands outstanding features the Cliffs of Moher, towering 700 feet above the Atlantic Ocean. Stroll along the cliffs to OBriens Tower and visit the interesting visitor centre. 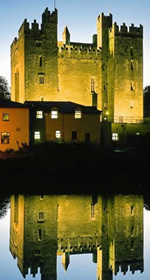 Travel via Lahinch to Bunratty and check into the Bunratty Castle Hotel for our final night. This evening we enjoy a Medieval Banquet with Irish entertainment in Bunratty Castle. To finalize our tour, in true Irish style, enjoy a Pint of Guinness in Durty Nellies famous pub. After breakfast, transfer to Shannon airport for return American Airlines flight to San Antonio via Philadelphia departing at 11:00am and arriving in San Antonio at 11:22pm.